Rated PG. Parental Guidance. General viewing, but some scenes may be unsuitable for young children. This is an Eros International brand of the Hindi DVD. Has the UPC Code 5028157207382. Has EROS Seal. 165 minutes Color. Dolby Digital 5.1 Surround Sound. HAS ENGLISH SUBTITLES. NTSC FORMAT-ALL REGIONS. INTERVIEW OF ANIL KAPOOR, ABHISHEK BACHCHAN & FARDEEN KHAN. BONUS GUJARATI TRACK. Directed by: Anupam Kher. Music: Anu Malik. Lyrics: Sameer. Written by: Rahul Nanda. Starring: Anil Kapoor, Fardeen Khan, Avhishek Bachchan, Waheeda Rehman, Urmila Matondkar, Mahima Chowdhury, Rara Sharma & Others. Release Date: 8 Jul 2002 (India). Widowed Mrs. Saraswati Batra (Waheeda Rehman) has brought up three sons with a lot of care and love. Her eldest son Om (Anil Kapoor) is very honest and diligent; her two other sons Jai (Fardeen Khan), and Jagdish (Abhishek Bachchan) also live in the same house. Om looks after the family, and also looks after the business and the estate. Jai's interest is fast cars, and to the much disappointment of his family, decides to re-locate the United States of America, and gets married to a rich and snobish girl, Neetu (Urmilla Matondkar). Her mother (Lilette Dubey) strongly disapproves of Jai, and vehemently, though in vain, opposes the marriage. To make matters worse, Jai gets a job in the U.S. in a vehicle junkyard, much to the horror of his wife and his family. Jai must use this junkyard so that he can make the fastest car in the world. Jagdish is the spoiled brat of the family. He gets into trouble with the law, when he starts hacking computer data. This brings shame on the entire family, and causes a loss of goodwill and profits, and results in the takeover of the estate by Shekhar Malhota, a close friend of the family. Now all the three brothers, their respective wives, and Mrs. Batra herself will have to come together to try and salvage what they can of their family business and estate. That is if they find time to do so from their very own personal problems and commitments. 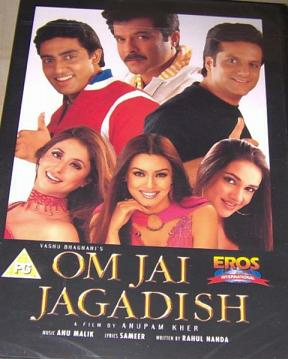 Buy Om Jai Jagadish (DVD, 2005), sold & shipped by Movie Time Video where you can shop online for Pooja Mandir, Bajot, Gifts, Hindi Movie DVD / CD, Music Video. This Hindi Movies collection has been tagged as BI 1 BE 1 NA 19.95 anil kapoor fardeen khan abhishek bachchan waheeda rehman.